There are many spectacular mountain biking oportunities on top of the Col de Tende. One route that the "Carte de Itineraires VTT" from the town Tende shows, is the Route du Sel. 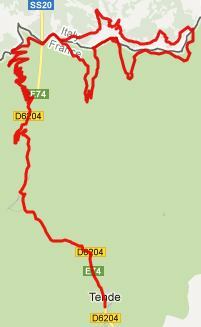 This is a loop that ascends Col de Tende and then descends to the town Tende on a long loop. But when you start riding it, it becomes apparent that the Italians were first to put up signs to their similarly sounding "La Via del Sale". The Via del Sale is a different route. It is a much shorter loop that starts and ends on the top of Col de Tende. What I had planned was the Route du Sel, but what I ended up doing was La Via del Sale. - Doesn't matter - any excuse to include some pictures from this scenically magnificent area. The profile includes the ascent to the Col de Tende from one side, followed by the loop of the Via del Sale. From East 1. Yes - there is a lot of spectacular scenery here. But the most historically interesting spot is still the old fort, just to the east of the pass. I followed this path past the fort along the ridge. Some distance after that, still on the ridge line you arrive at a prominent signed first junction. From here two roads lead to two higher visible summits. Following the Italian "La Via del Sale" sign, the route points towards the right onto French territory. The French Route "Route du Sel" also goes right here, even though tere is no sign. The first switchback happens at Fort Pepin. Here the routes diverge. The Italian La Via del Sale" makes a steep switchback, then become a magnificent climbing single track and crests. Apparently the "Route du Sel" descends from the Fort directly into Tende, bypassing the single track and the highest portion of the "La Via del Sale". From East 2. (described downwards) From the summit it is now visible that across towards the west, a dirt road (really a rock road) climbs towards Col de la Baovia. The single track track from the summit we are on, descends to a junction with this road. Maps label this point Col de Perle. There is a strong temptation to go right here, in the belief that this must lead back to Tende. According to maps this is not the case. More importantly a "prive" sign forbids entry to this option. Instead the "La Via de Sale" sign now directs to take a left turn. This route returns over the second summit point, visible from the first junction mentioned in the East 1 approach. Notes: the out and back contains a short section of the Ligurische Grenzkammstrasse (=Ligurian border range road).